Whether you need a little extra cash to make rent or you simply want to explore your passions outside of work and get paid for it, a side hustle can be a lucrative way to bring in more income — without waiting for your boss to hand out a raise. The side hustle economy is booming. In fact, according to a study from BankRate, nearly 37 percent of Americans have a side job, and they’re making an average of more than $8,000 every single year. Your side hustle is exactly what it sounds like: A gig that you juggle alongside your day job. Balancing your side hustle against everything else isn’t easy, but it can be lucrative, not to mention fulfilling. If you’ve got a passion that pays, you probably already have a good side hustle going. But if you’re in the market for a little extra dough and you’re not sure where to start, this list of the seven best hustles should help. Influencers are so effective as marketers because they are seen as authentic and trusted — to their followers, they are friends, not advertisers. Therefore, you might find incredible traction within your field (and beyond) if you’re able to monetize your social media activity, particularly on Instagram. Take, for example, the growing community of teachers as Instagram influencers. They inspire fellow education with their color-coding, organizing, decorations and curriculum planning, and some of them get paid more — much more — for their IG work than their “full-time” job. This is a long-term play, however. You need to be well-established in your niche before brands think about approaching you for paid work. If you live in a competitive real estate market, you probably know someone in this business. The real estate business is enormous and can be lucrative, based on how much time and energy you have to devote to it. Real estate is a great venture to start part-time as you build a client base and learn the intricacies of the business. To become an agent, you’ll need to take a course and pass a test to obtain your local real estate license. You may also want to work under a brokerage that offers you protection and leads on clients, so there is a bit of an upfront, as well as ongoing, cost. Showing houses and apartments, however, typically happens during unusual or non-work hours, like nights and weekends — which means it could fit right into your schedule. Helping small businesses or other sole proprietors with their taxes sounds like a tough side gig, especially with the rise of easy-to-use tax software. But about 70 percent of small businesses outsource their tax preparation duties, meaning there’s a market for being willing to roll up your sleeves and learn how to prepare taxes for others. Doing remote monthly bookkeeping for small businesses on retainer, writing and producing a web seminar or e-book on how to file, or helping businesses craft a business plan they can use when applying for a loan are all small, but focused, ways to put some accounting knowledge to good use. Taking photos or videos is an excellent example of a popular hobby that can become a lucrative side hustle if you’re willing to invest in the tools and in building up your client base. Good freelance photographers and videographers are often hired by individuals, businesses and organizations to document events, take headshots and work at parties like weddings or engagements. You can set your own rates depending on the quality of your equipment, your time in business, your particular style and whatever other variables go into the difficulty of taking the pictures/videos and editing them on the side. A great way to break into freelance writing is to offer businesses your services as a content writer, with an emphasis on helping with search engine optimization. If you’ve always been a skilled creative writer and want to start making money from the craft, a few free courses or blog posts can teach you the basics of writing with an eye towards SEO-friendly content that businesses need to rank higher in search. Small businesses are increasingly using blogs and social media content to attract new customers and drive traffic to their website. Create a website, craft an introductory email, and start pitching businesses on the idea of you writing content for them on topics related to their industry. Have you become an expert in your chosen field and want to pass your knowledge and skills on to those trying to make a name for themselves? Are you the friend everyone turns to for advice, because you’re not just a good listener but preternaturally wise? If so, professional or life coaching could be a fun avenue to explore. Good coaches are typically credentialed by an organization like the ICF in order to assure clients of their background, but there is no law that says you need one. You could start coaching on an informal basis before making the leap to more professional coaching. Coaches typically have a niche in leadership or executive coaching, life coaching, relationship coaching or career coaching. Consulting in your field is also a strong possibility if you’re experienced enough to justify the role. Selecting a niche and setting up a website or platform to begin marketing yourself is the first step. Networking to find and develop clients is the next. Related: Want to Get That Side Hustle You’ve Been Dreaming of off the Ground This Year? This one is worth mentioning because of its popularity. It’s one of the biggest side hustles out there that is arguably available to everyone — unlike a slightly more specialized hustle like construction/repair work. If crafting is your hobby and you feel confident that you can sell your wares to people outside of your friend group, it’s easier than ever to set up an Etsy or Shopify page to promote and sell whatever it is you make to the masses. Be careful not to turn a hobby you love into an ecommerce job you hate: Stay true to what drew you to the craft in the first place and don’t overextend yourself. A side hustle isn’t just about the money. 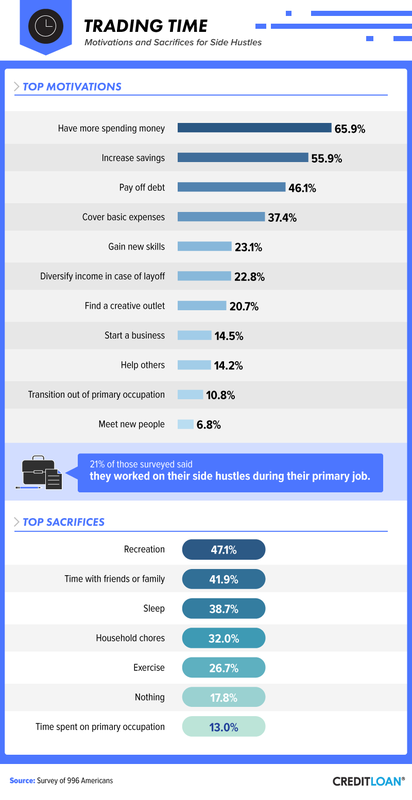 According to The Hustle, a larger percentage of survey respondents say they “love” their side gig more than their actual job –and since side hustlers make an average of just $686 a month, it likely has to be a labor of love. If you can find a hustle that helps you save for a vacation or afford a nicer apartment, however, you’ll love it even more.